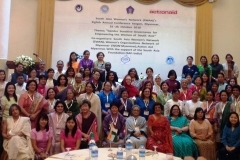 SWAN’s Eighth Annual Conference in Yangon, Myanmar, had as its theme the all-important aspect of Gender-Sensitive Governance for Empowering the Women of South Asia. Governance issues were the focus in each of the four thematic sessions, especially in the one on Changing Mindsets for Empowering the Women of South Asia. The Inaugural Session was chaired by Ms Khyn Hla Hla Aung (Cherie), CEO and Designer, Elephant House, Ltd. The Welcome Address was delivered by Daw Khin Lay, WON-Myanmar. She warmly congratulated the two SWAN sisters from Myanmar who have been successfully elected to the Upper House of the Parliament of Myanmar as representatives of the National League for Democracy (NLD) led by Daw Aung San Suu Kyi : Daw Susanna Hla Hla Soe, and Daw Shwe Shwe Sein Latt. It is through their untiring efforts that all organizational difficulties, including visas, have been overcome, thereby facilitating this SWAN Conference. All SWAN delegates gave them a standing ovation. Daw Khin Lay emphasized the importance of ensuring inclusiveness of women in every aspect of governance, and highlighted the shared difficulties facing women of South Asia and Southeast Asia. Ambassador Veena Sikri, Convener, SWAN, congratulated and thanked all SWAN sisters from Myanmar, especially Daw Susanna Hla Hla Soe, Daw Shwe Shwe Sein Latt, and Ms Khyn Hla Hla Aung (Cherie) for their tremendous support in bringing everything so successfully together for this Conference. She thanked Action Aid Myanmar and South Asia Foundation (SAF-India) for their strong and unflinching support for this Conference. Myanmar has a South Asian identity side-by-side with its strong Southeast Asian identity. SWAN highly values the active participation of Myanmar in SWAN’s programmes, meetings and projects. Professor Sikri described the progress achieved by SWAN under each head of activity, and explained the key issues proposed to be taken up at this, the Eighth Annual Conference. The problems associated with the feminization of poverty (seven out of every ten poor people in the world are women) are particularly pronounced in South Asia, and therefore, inclusive governance becomes all the more vital and necessary for this region. SWAN’s objective is to ensure that women themselves are the source of change : they should be the change they want to see. Dr Jean D’Cunha, Head of UN Women Myanmar addressed the audience on transformative women’s leadership and governance. She emphasized the need for a critical mass of women leaders who will then ensure inclusive governance based on gender justice and gender equality at all levels, incorporating interaction with men and boys as part of the solution, not as part of the problem. Mr Shihab Uddin Ahamad, Country Director, Action Aid Myanmar, welcomed all the SWAN delegates, emphasising how much Action Aid Myanmar has enjoyed its coordinating role in organizing this Conference. Dr Maithree Wickramasinghe, Professor of English, University of Kelaniya, (Sri Lanka), in her Special address, recalled her association with SWAN going back to the first Annual Conference in 2009 in New Delhi. She emphasized Ms. Lalitha Kumaramangalam the importance of ensuring that governments are gender sensitive and gender responsive in their governance. This involves understanding the concept of gender equity, which goes beyond gender equality, in that it requires and incorporates the concept of biological differences between men and women. Governments and individuals must work together to eliminate the scourge of sexual harassment and violence against women that plagues each of our societies. Ms Lalitha Kumaramangalam, Chairperson, National Commission for Women, New Delhi, in her Special Address, emphasized several key points : that the patriarchal mindset exists among men and women; that violence against women is not restricted just to physical violence, but goes much beyond that; that women leaders are nor necessarily better for women; and above all, it is vital, in order to ensure a gender equal society, that both women and men are involved in capacity building and orientation programmes. In India, even though women have reservation in election to panchayat (local self-governance) bodies, this cannot benefit them unless they are adequately trained in financial literacy, on allocation and utilization of funds. Women at grass-roots level need education about legal rights as well. India’s National Commission for Women has seen how capacity building on financial and legal rights gives women enormous self-confidence and awareness on issues relating to gender equality and gender justice. Hon’ble Lyonpo Dorji Choden, Chairperson, National Commission for Women and Children, and Minister for Works and Human Settlement, Government of Bhutan, in her Special Address, emphasized that SWAN as an organization has come a long way and progressed enormously since its inception in 2009. SWAN has the potential to be a very powerful mechanism. 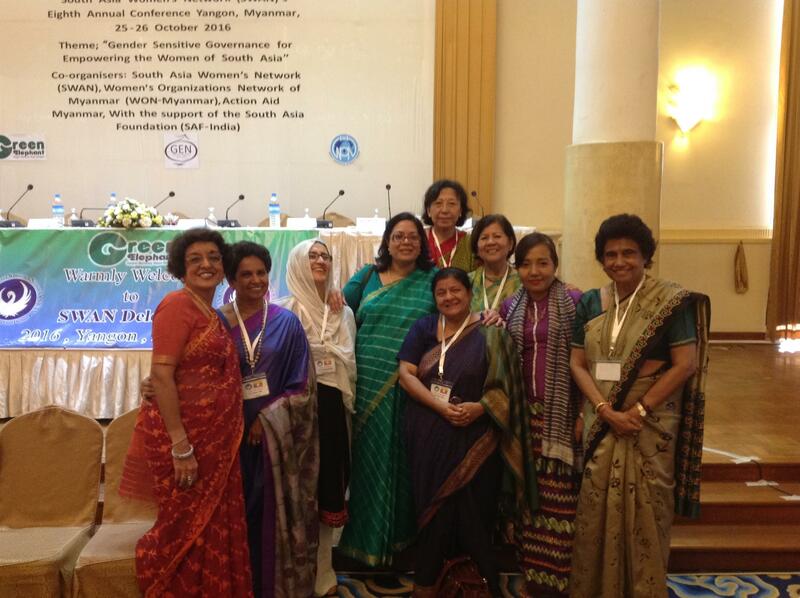 SWAN provides a vital platform for the women of South Asia to share best practices and exchange experiences. SWAN has now embarked on several significant projects, like ecotourism (or rural tourism), building a gendered media in South Asia, and the skills development initiative. Media plays a critical role in changing mindsets, and that is why the UNESCO SWAN initiative on Women in Media is so important. In Bhutan, we have seen that having gender equal laws is not enough. Women (and men) must be made aware of the importance of gender equality and equal representation for women in Parliament and other institutions. No women were getting elected through the ballot-box. Could it be that women were not voting for women? We are proud to see that Ms Kesang Chuki Dorjee has been nominated as a Member of the Upper House of Parliament by His Majesty the King of Bhutan. Kesang has been an active member of SWAN since its inception. (Kesang was heartily congratulated and cheered by one and all on this outstanding achievement). In Bhutan, we are continuing our work on equal rights for women, no matter whether it is adequate maternity leave or other conditions of work. Bhutan has a strong Domestic Violence Prevention Act, passed by our Parliament in 2013. Ensuring gender equality and gender empowerment in South Asia is as much a developmental issue as it is a human rights issue. The denial of their rights has vastly excluded the women of South Asia from participating in or benefitting from the process of development. This is now a major factor hampering and holding back development, not just for women but for society as a whole. No nation can develop and prosper by leaving out women, who form half the population. The genesis of the problems faced by the women of South Asia is certainly complex and multi-facetted, with some aspects that could be specific to individual communities, ethnicities and religions. Across discussions in SWAN’s seven Annual Conferences, the most consistent refrain has been that the crux of the problem lies in the firmly entrenched mindset towards women, a mindset that mitigates against respect, equality and empowerment for the women of South Asia. Essentially, the patriarchal system, as it has evolved, has brought in a mindset that ensures women’s subordinate role within family and society. As a result, women are exposed to violence in its worst forms, the girl-child has seriously reduced access to educational facilities, and mothers to healthcare, including maternal healthcare. Patriarchy and violence, including threats of violence, erode the very foundations of gender justice. They undermine and negate the objectives of constitutional and legal provisions favouring gender equality, and obstruct the advancement and empowerment of women in social, political and economic spheres of activity. The patriarchal mindset and hierarchy has ensured that most government policies (across South Asia) have been gender-blind in their formulation and implementation, failing to give due weightage to the specific needs of women to help them overcome their disadvantaged position in society. This has only further strengthened patriarchal norms, and has denied to most women any substantive benefit from the process of economic development across and within the countries of South Asia. Secondly, SWAN strongly supports an integrated approach for gender sensitive governance, incorporating and combining democratic and inclusive good governance with the centrality of women’s agency, voice, participation and leadership. This alone can bring in the positive changes in socio-economic prosperity and empowerment of women that are the essential pre-requisites for sustainable development of society as a whole. SWAN has repeatedly focused on this crucial and vexatious issue. In May 2014 SWAN organized, in Kathmandu, the Conference on “Democracy and Inclusive Good Governance for Gender Equality and Sustainable Development in South Asia”. In SWAN’s Eighth Annual Conference in Yangon, SWAN delegates addressed key aspects of this problem. Professor Maithree Wickramasinghe (Sri Lanka) pointed out that today, the concept of good governance rarely includes gender equality and gender sensitivity. This is the first mindset change that is needed, through the acceptance that good governance must be inclusive of gender equality. In 2013, Care International published disturbing findings about the sense of impunity, even entitlement among male perpetrators of violence against women, including their own partners. University campuses share this sub-culture of patriarchy and gender inequality among students. All efforts to change mindsets invite strong backlash. We need to be pragmatic yet strategic in planning our efforts. Hon’ble Member of Parliament, Daw Shwe Shwe Sein Latt (Myanmar), emphasized that the problems of mindset change are different at family/ individual level, at society/ community level, and at the State level. Women rarely get to exercise free choice, and so they feel disheartened. Negative mindset against them influences every aspect of their lives, especially if they are in politics. In Myanmar we are trying to develop gender sensitive policies to ensure gender mainstreaming. Hon’ble Member of Parliament Ms Kesang Chuki Dorjee (Bhutan) appreciated the work SWAN is doing, especially through the UNESCO SWAN Women in Media initiative. She herself has made every effort to encourage exchange of news stories and enhanced media coverage among SWAN countries. However, SWAN should think of involving some of the younger generation, including young professionals in their activities. This is vital. Women should work towards making a difference, and ensuring their rights, no matter what their field of work. Hon’ble Member of Parliament, Ms Raihana Azad (Afghanistan) spoke about the struggle in changing conservative mindsets in Afghanistan. However, there is a palpable difference today. Thirty eight per cent of the 8 million school-going children in Afghanistan are girls. Media has a very important role to play in raising awareness about gender equality and women’s issues in general. Women of Afghanistan will never be defeated. We are looking forward to the day when we have a woman President in Afghanistan. Several SWAN delegates spoke about changing mindset issues in their respective areas of work. Ms Mome Saleem (Pakistan) said that for changing mindsets, a comprehensive approach is necessary, covering school curriculum and textbooks as well as informal education and social media. Children today learn from social media rather than from school text-books. Media gives voice to the people, but also to those who oppress. In South Asia, women are often victimized through misinterpretation of religion. All these aspects need to be taken into account. Dr Sujatha Samarakoon (Sri Lanka) described the SWAN Sri Lanka project among plantation workers, using peer educators to counter violence against women, teenage pregnancies, HIV Aids, and even trafficking. Dr Mira Shiva (India) described the negative impact of malnutrition on women’s health, and how this impacted every part of their life and activity. SWAN should take up this issue seriously. Ms Madeeha Gauhar (Pakistan) spoke about the powerful message that is conveyed by theatre performances, and its impact it can have, especially on young minds. The medium of theatre is vital in the process of changing mindsets. Otherwise, even though there may be existing laws to protect women, there are other laws that adversely impact women, and so the status quo remains unchanged. Ms Usha Ganguly (India) urged that playwrights create theatre that can contribute strongly and positively towards changing mindsets about women. Daw Susanna Hla Hla Soe (Myanmar) described her efforts at changing mindsets through her work as Chair of Myanmar’s Parliamentary Standing Committee on Women and Children. Every effort is being made to pass good laws to help women, especially on preventing violence against women and children. Action Aid screened a short film on this. With more and more women working in newly established industrial zones, such laws are essential. Session II. WOMEN FOR CHANGE : BUILDING A GENDERED MEDIA FOR THE WOMEN OF SOUTH ASIA : The UNESCO SWAN Women in Media Initiative was launched at SWAN’s Sixth Annual Conference In Thimphu (Bhutan) in September 2014. At SWAN’s Seventh Annual Conference in Maldives, the content, methodology, participation and planned outcome of this project was discussed and agreed upon. This unique project synergises the strengths and successes of SWAN and UNESCO in their respective fields of endeavour. The key objectives of the project are to address the vulnerability of women journalists in South Asia; to strengthen the gender sensitivity of the South Asian media, including on portrayal of women in media content and through advertising; and to engage with stakeholders, including advocacy wih governments, to bring about gender equality in and through the media. SWAN’s Eighth Annual Conference in Yangon was informed about the significant progress that has been made in the implementation of Phase I of this Project. Professor Veena Sikri, Convener, SWAN, and Mr Al-Amin Yusuph, Advisor for Communication and Information, UNESCO Cluster Office, New Delhi, gave detailed presentations on the current status of the project, with the focus on the developments during 2016. In particular, they highlighted some of the difficulties that such a project could face in its implementation, including budgetary and funding issues, structural issues, cooperation of private sector media editors/ owners and ad-agency owners, and advocacy strategies for bringing governments on board. UNESCO and SWAN agree on the critical role of the media as a reflection of society and an agent of change, through media freedom with responsibility. UNESCO and SWAN recognize the importance of gender empowerment as a key to sustainable economic growth, social development, environmental sustainability, and promotion of peace in South Asia. If sufficiently empowered, women in media across South Asia can themselves play a critical role in creating awareness about the need for gender empowerment and for building inclusive societies. Women in media can become agents for bringing in the change they want to see. UNESCO and SWAN strongly emphasise the need to deter, counter and overcome gender-based violence (GBV) and sexual harassment as cross-cutting priority issues that adversely impact every aspect of women’s work in media. While levels of media development show considerable variation across individual countries in South Asia, the media environment in the region remains especially fraught with challenges for women media practitioners. Women media professionals in the region face multiple forms of discrimination, including differential pay and working conditions, inadequate workplace support, harassment, and a glass ceiling that limits professional growth. Women’s voices in the news media are lacking, and the portrayal of women in media content, including the advertising sector, remains skewed. After intensive preparation, UNESCO and SWAN collaborated to convene the first Regional Consultations under this project. 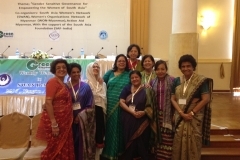 These were held in New Delhi on 3-5 May 2016, with the participation of leading women media representatives from across South Asia. This was a path-breaking event, which defined the principal phases of the project, and took substantive steps towards implementing Phase I by agreeing upon the Gender Sensitve Guidelines for Women in Media in South Asia (GSGWMSA). Undertake a Baseline Survey to assess the status of women media practitioners in South Asian countries, thereby providing a basis for monitoring and evaluation, together with a roadmap for measuring annual progress and achievements. Based on the Outcome of Phase II, as expressed through the Report on the Status of Women in Media in South Asia, develop the methodology for advocating the adoption of the proposed guidelines and standards, and the mechanisms for implementing and monitoring this initiative in the participating South Asian countries, including through mid-line and end-line surveys, and the Gender Sensitivity Barometer. The Final Report of the Regional Consultations (May 2016) has the draft of the Gender Sensitive Guidelines for Women in Media in South Asia (GSGWMSA). These Guidelines cover print, electronic and online media, including entertainment media and advertising. The Report also includes the proposed modalities for the Baseline Survey. The Report of the May 2016 Regional Consultations is Annexed below. After the May 2016 Regional Consultations, National Consultations were convened in seven of the nine SWAN nations. The objective of these broad-based National Consultations was to facilitate a discussion of the GSGWMSA (agreed upon at the May 2016 Regional Consultations) and to seek a national-level validation of the GSGWMSA. The GSGWMSA were discussed and validated at National Consultations convened separately in Afghanistan (Kabul and four provinces, August 2016), Bangladesh (Dhaka, October 2016), India (New Delhi, August 2016), Maldives (Male, September 2016), Nepal (Kathmandu, September 2016), Pakistan (Karachi, October 2016), and Sri Lanka (Colombo, October 2016). The vigorous discussions and exchange of views through these national consultations have been encapsulated in the individual Reports of these National Consultations prepared for UNESCO and SWAN. These National Reports were presented at SWAN’s Yangon Conference by the respective participants. There was a substantive exchange of views, following which the GSGWMSA were endorsed and adopted at the at SWAN’s 8th Annual Conference in Yangon. SWAN’s 8th Annual Conference in Yangon agreed that with this, Phase I of the UNESCO SWAN project has been completed. The Conference discussed the methodology for the Baseline Survey. It was agreed that detailed guidelines on the Baseline Survey will be provided (for participating delegates and institutions) through the Regional Coordinating Team, in particular the Media Research Coordinators, Professor Gita Bamezai (Indian Institute of Mass Communication, New Delhi) and Professor Jaishri Jethwaney (ISID, Institute for Studies in Industrial development, New Delhi). UNESCO (Al-Amin Yusuph) informed the Conference about the efforts being made to raise financial resources to fund the UNESCO SWAN initiative, including from the SAARC Development Fund and the IPDC Secretariat. The Conference welcomed the participation of Myanmar in this important project through Ms Thin Thin Aung, Founder and Director, Mizzima Media Group, Yangon. Ms Thin Thin Aung emphasized that the secondary and primary research, survey and quantitative analysis-based approach incorporated into the UNESCO SWAN project is important, timely and valuable for women in media in Myanmar, and for the advancement of women as a whole in society. SWAN’s Skills and Entrepreneurship Development Initiative is among the first to be taken up for formulation as a specific project. The women of South Asia are the inheritors and custodians of traditional knowledge and the most ancient skills, which they continue to practice to this day. Yet they are unable to leverage this knowledge and the skills into instruments of empowerment and strength. A significant proportion of the economically active women of South Asia are fine crafts-persons, skilled as a part of customary training in the social context. Their work remains confined primarily to the unorganized sector. They combine their crafts-work with their equally traditional and rigid commitment to agricultural and household activities. Since the returns from their traditional crafts-skills are so inadequate, women, particularly the younger generation, are losing interest in acquiring or maintaining these skills. In several instances, traditional crafts-skills are on the verge of being lost to posterity. These crafts-skills can be revived and preserved only if they become economically viable and, through this, the source of respect and empowerment for the women practicing these skills. Across South Asia, a large proportion of young girls do not complete primary or secondary education. Even where young girls do complete primary and secondary school, there are few prospects of stable employment or skills enhancement. Young girls, who are either school drop-outs or school leavers with no employable skills, become disheartened and uninterested in continuing formal education. They are therefore very vulnerable to exploitation, including gender-based violence, and the pressures of early marriage. Based on decisions at SWAN’s Seventh Annual Conference, a major project is under formulation, being coordinated by Bhutan. This is being planned as a three-year project to empower the women of South Asia through skills-training under master trainers, combined with access to finance, and the SWAN brand product development. The project will cover key aspects of the value-chain, including skill enhancement, product design, marketing channels and credit (access to finance) channels. This initiative would identify prominent crafts from each country, and facilitate enterprise-development and entrepreneurship-development around these crafts. This project is expected to bring together several essential strands of skills development and co-creation for empowering the women of South Asia : skills enhancement, access to finance, and sharing across borders through the SWAN brand product development. It will be placed before the SAARC Development Fund with the request for financial support. The title of this project is “Enhancement of Employable Skills and Entrepreneurship Development for Women and out of School Girls of South Asia”. Four countries are participating in the project : Bhutan, India, Maldives and Nepal. At SWAN’s eighth Annual Conference in Yangon, the full details of this project were presented by Hon’ble Lyonpo Dorji Choden (Bhutan). She felt that this could be a flagship project for SWAN, targeting young girls who are out of school, and women from socially deprived groups. SWAN branding and marketing through social business organisations could create a major impact. Each of the participating countries made presentations on their respective plans for this project. Participants from Bangladesh and Pakistan, even though they are not participating in the project directly, explained how they would be happy to share skills (respectively in paper-making and garment-designing) to ensure success and early returns for the SWAN project. Afghanistan appreciated the tremendous relevance of this project. South Asia is a region of great bio-diversity and rich geographic diversity, ranging from tropical eco-systems to those of the highest Himalayas. Tourism is naturally the major revenue generator for all countries of this region. It is also the most instinctive and successful way to bring the peoples of South Asia closer to each other. However, conventional mass tourism must become more responsible in order to be sustainable. Tourism activities should not destroy either the environment or local traditions and indigenous knowledge, nor should they exclude local communities. In all these aspects, eco-tourism is showing the way forward by being inclusive and strengthening rural communities. Ecotourism is essential for sustainable development of regions and people. Ecotourism is environmentally responsible tourism. Ecotourism inculcates respect for different cultures and sub-cultures. It is crucial to integrate women into the process of sustainable eco-tourism development. Women play a central role in rural communities in crafts and textiles, waste management, arts and music, cuisine and hospitality, preservation of the environment and culture, and inculcating traditional values in the next generation. All these are core values for the development of eco-tourism. In making local communities beneficiaries, even stake-holders in eco-tourism projects, the aspect of gender empowerment for the women in these communities should be given the highest priority. Eco-tourism should become part and parcel of skills, livelihood and sustainable development programmes for the women of South Asia. SWAN has been actively pursuing formulation of a project on Ecotourism with the focus on empowerment of women in rural areas, beginning with the Workshop on Ecotourism convened in tandem with SWAN’s Sixth Annual Conference in Thimphu (2014). At SWAN’s Seventh Annual Conference in Maldives, the objectives of the proposed project were elucidated in detail. Each of the six participating SWAN countries (Bangladesh, Bhutan, India, Maldives, Nepal, and Sri Lanka) has identified their respective ecotourism site(s), and prepared the template for comprehensive ecotourism development with gender empowerment as its core, including employment, entrepreneurship, leadership and community development, based on best practices and guidance from expert individuals and organisations. At SWAN’s Eighth Annual Conference in Yangon, the Lead Implementing and Executing Agency, Himmotthan Society, Dehradun (Dr Malavika Chauhan, Executive Director), gave a extensive and intensive presentation on the contours of the project. In coordination with the Implementing Agencies in each participating country, Himmotthan Society has now finalised the three year project, and submitted this to the SAARC Development Fund (SDF) in Thimphu for financing. The first draft of the consolidated project was submitted to SDF in April 2016. The comments received from SDF have been taken on board and the second revised draft was submitted to SDF in October 2016. A response is now awaited from SDF. The title of the project is “Sustainable Development and Gender Empowerment in South Asia : A Rural Tourism Based Social Enterprise Project”. Representatives of the partnering countries presented their proposals and elaborated on the relevance of their project designs : For Bhutan, the focus is to open up two hitherto lesser known areas (districts or dzongkhags) to a women-centric tourism enterprise which will take forward the country’s mandate of regionally and seasonally distributed, sustainable community and heritage-based tourism; In Maldives, which has a unique island topography, the Implementing Agency intends to work with the women of two small, isolated atolls, respectively in the southern and northern regions. The project is focused on reviving heritage and traditional art and theatre in natural ecological scenarios, highlighting women’s contribution and through them building a rural tourism based enterprise, which would generate income for the community. In Sri Lanka, the focus is on the Southern Galle district, to work with women and their families on the development of a self-managed ecotourism enterprise, including organic farming, creation of Farm Lodges and Eco-lodges, local arts, crafts and culture, local cuisine, cultural activities such as village trekking, cycling and boating. In Bangladesh, through this project the Implementing Agency intends to focus on reviving the Khasi community’s culture and heritage through women entrepreneurship programs. The focus would be on handicrafts, cuisine, art, culture, music and dance. The second site for the project is in Tangail district. In India, in the northern State of Uttarakhand, it is proposed to develop rural tourism enterprises through women’s community involvement and efforts. In Nepal, the focus in the selected six districts is on rehabilitating women affected by the 2015 earthquake, empowering them through entrepreneurship and self-reliance development projects centred around rural tourism. One vital objective that should be lost sight of is for each individual project to give highest priority to forming and strengthening vibrant community led institutions to take up different activities, in order to ensure economic viability and sustainability. At the end of the session Action Aid Myanmar presented a case study which can be considered as a model for future replication. In the Valedictory Session, the Conference received Reports from each of the Session Chairs. In conclusion, the SWAN family gave an enormous vote of thanks and gratitude to the SWAN team in Yangon, including the tremendous support and excellent facilities provided by the Inya Lake Hotel.